After the dust had settled from David Beckham’s red card and loss on penalties, the one shinning light was this lad from Chester. If he could do this when he was only 18 think what he could achieve over the next 10 years, his first shave perhaps. Liverpool and England fans alike were salivating over the potential this boy (man) possessed and for the next 5 years he was to fulfil it as much as could be expected. The next season he went on to win a second Premiership Golden Boot (I wonder if they gave him a left and right?) including hat-tricks against Newcastle and Forest carrying Liverpool as best he could before injuring his hamstring towards the end of the season, an injury that would re-occur throughout his career. He spent the next season in Dave Galley’s bed getting to know him better. Sorry, on Dave’s bed getting his legs rubbed…what I’m trying to say is Mr Galley was the physio and Owen was still injured. The only thing to cheer Owen up was that somehow he managed to finish the season as Liverpool’s top scorer with 12(!! ), and the name of his doctor: Hans-Wilhelm Müller-Wolfahrt, who was to help make his hamstring strong enough for the season to come. And what a season it was; the strangest treble ever and Liverpool qualifying for Europe’s premier competition for the first time in 16 years. His 24 goals that season helped Liverpool to the UEFA Cup, Worthington Cup (Sponsored by the ex-Norwich Boss Nigel, presumably) and most memorably the FA Cup. Just as Steven Gerrard was to do six years later, Owen grabbed Liverpool in the last ten minutes of the game and dragged them kicking and screaming across the line to the take the cup. The similarities with Gerrard’s performance are more than just to do with the timing of their last minutes goals, but also in how their goals were scored both personifying their respective players skill sets. Gerrard’s long range belter from the edge of the box, and Michael out pacing Lee Dixon and then sending it with sniper precision into the bottom corner. At that time, although Stevie G was in the team, it was Owen who was becoming the one man in the one-man team. Here was a true English talent actually living up to his potential and with no signs of Gazza-like self-destruction tendencies (although he did attend the infamous ‘98 Liverpool Christmas party). Could it be, The Messiah? No, that was Keegan. God? Bit strong, and that was already taken by his Liverpool teammate, Fowler. Mohamed? Let’s not go there. Vishnu…really? As far as nicknames go, St Michael wasn’t massively inspiring, more fitting to a water polo player one would have thought, but he kept getting better. The next season he broke through the 100 goal mark for Liverpool and picked up The “Balloon of Or” award, the strangely named European Footballer of the Year accolade, beating the Street Fighter character Raul to the coveted prize. With the World Cup fast approaching it seemed timing couldn’t have been better for England. It’s difficult not to get all teary-eyed and emotional whenever I think about The 5-1, as I get older people occasionally try to analyze the game and tell me how bad Germany were (they went on to reach the final of that World Cup, actually) but I could quite happily live in a Groundhog Day existence of that event. For me those 4 months to the end of the year were the crest of the wave for Owen, it wouldn’t get any better than that, which is sad when you consider he was only 22 (years not inches). Shearer’s retirement from the international scene was to have mixed benefits for the diminutive striker (wow I’ve avoided that cliché for 800 words). He was elevated to England’s main forward but at the same time it would remove arguably his best partner. England, then as now, get stage fright in big games and revert to the long ball, which doesn’t suit Owen unless, he has an “old fashioned number nine” with him but despite their statures neither Heskey nor Crouch could provide the same support as was demonstrated by the lonely furrow he ploughed for most of the game against Brazil in Japan. 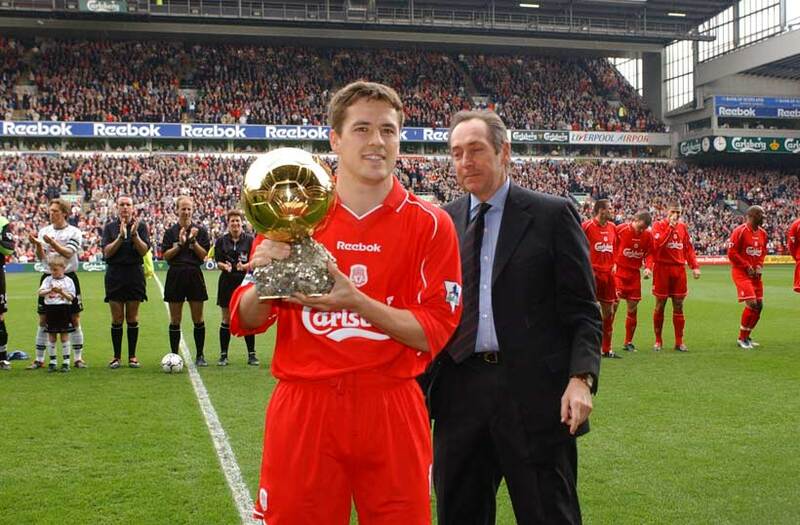 The next two seasons he would continue to provide the goals for Liverpool picking up the Generic Beer Brand Cup in 2003 and helping them finish 4th (the new 1st) in 03/04. That summer it was all change for Owen. David Moores swapped French for Spanish bringing in Rafa Benitez for Gerrard Houllier, Michael didn’t like the taste of his paella and left for Madrid (who’d been flirting outrageously with him for the last two years) to get some authentic cuisine. Owen also changed roles for England from lead role and focal point to support part and assist-provider for the up-and-coming Wayne Rooney. At the time it might not have seemed like his career was on a downward trajectory, after all he’d just signed as a Galactico, and at the tender age of 24 he had already scored 26 goals for his country. Surely he was on target to beat Bobby Charlton’s 49 goal record and he hadn’t even reached the magical 28-year-old mark. From here on out though, things changed dramatically for the Cheshire lad. His well documented year in Spain where his buttocks were put to the test as seat-warming devices, followed by an injury-ravaged spell at Newcastle leaving his career in limbo. The next few years after that could only provide him with cameos at Manchester United and Stoke City leading one to wonder despite his amazing record what could have been. Injuries obviously played their part but I can’t help but wonder about the psychological impacts his freezing out at Madrid and his swift usurping as England’s talisman had on him. All that time he spent on his own in Madrid hotel rooms to reflect on life and how the summer before this fellow Scouser, Rooney, had hustled him out of his most prized possession and made him look one dimensional and dispensable. I remember in the interviews after the Croatia game at Euros (in which Rooney had scored twice, Owen mainly creating space and chances for his partner) where people awkwardly and unconvincingly tried to answer questions about his subservient role to the Everton player. Maybe that’s a bit much, but the structure of the England team changed after that and its focus was no longer Michael Owen. In most “fall from grace” stories there is a moral to be drawn or important lesson to be learnt for the next generation of players, but in this case it’s hard to find one. Owen reached his potential in terms of ability but was unable to sustain it as he found himself on the losing end of managerial poker and injury roulette, leaving Sir Bobby’s record safe for a while longer. This entry was posted in Player profiles and tagged england, liverpool, michael owen, steven gerrard, wayne rooney, world cup 1998 by The False Nine. Bookmark the permalink.